I have to admit, I’m not much of a wrench turner. I’d love to know more about what goes on under the hood, but so far, I’m just not one of those guys. I’m learning though, and hope to change my lack of mechanical ability. 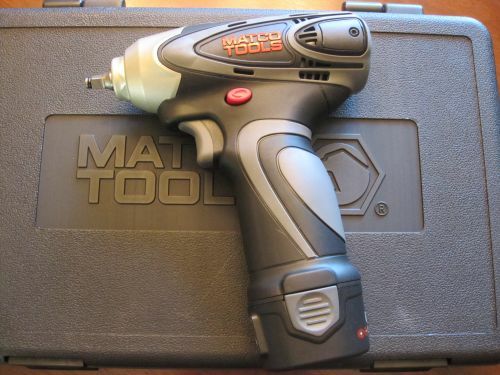 Knowing that, it’s no surprise that when I cracked open a box of tools Matco Tools had sent for me to review, that, although the wrenches and cordless impact wrench looked and felt very nice, I wasn’t overly impressed. In fact, it wasn’t until one of my neighbors stopped by and happened to see the tools that I realized how incredible these Matco tools truly are. My neighbor went absolutely NUTS over them. It was pretty funny. He kept looking them over, turning the ratchets with his finger, and generally staring in awe at the quality. After taking another look at the tools, and doing a little research online, I have to say, these are probably the finest tools I’ve ever touched. First, the 90 Tooth Ratcheting Wrench Set. 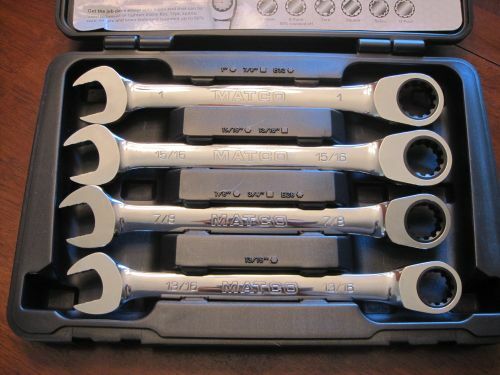 Included in the set are four wrenches in the following sizes: 13/16″, 7/8″, 15/16″ and 1″. Plenty of options for your mechanical needs. The wrenches are heavy duty, without being unmanageable. The most impressive feature about them, though, that I missed when I first unboxed the tools, is the ratcheting mechanism. The 90 teeth deliver one of the best swing arcs in the industry making short order of work in tight spaces. The versatility of these wrenches allow them to loosen or tighten many 6pt, 12pt, spline, torx, square and even up to 50% rounded fasteners. You also don’t have to worry about the tools failing you. They’re forged from higher carbon steel and the same heat treating process used to manufacture jet landing gear. The impact wrench feels great in your hand, and although I haven’t used it yet, I can’t wait to try it. Overall, I have to say, I’m very very impressed by these Matco Tools wrenches. After taking a look at some of the tools I thought were the best I’d ever used, and comparing them to this tiny sampling of what Matco Tools have to offer, there simply is no comparison. The tools aren’t cheap, by any stretch of the imagination, but they’re well worth the price of admission. One interesting note is how well these tools hold their value. I was surprised to see used Matco Tools going for 70% and 80% of their retail value, despite being several years old. I suspect these are tools you will never sell, though, but instead will hang on to, enjoy, then pass on to your kids. A special thanks to Matco Tools for sending these tools for review. Visit MatcoTools.com to check out their entire line of quality products. I have a smaller version of the wrench set and I love them. no more flip and quarter turn in tight areas saves lots of time and aggravation. if you haven’t got a set yet get one you will wonder how you ever got by with out them. Nice wrenches but they are SAE; kind of useless on a Porsche which is metric. As for the Impact Wrench, I personally would never use one unless I was working on a rust bucket where most fasteners are seized. Chris, you’re absolutely right, but Matco makes metric wrenches as well. Choosing the right tool for the job, as you mentioned about the Impact Wrench, is absolutely critical. Couldn’t agree with you more on that point. Wow, i had no ideas that those tools were so versatile! It is so cool to see the craftsmanship that goes into each and every tool. They are designed to be both sleek and very utilitarian at the same time.